Josiah Harvey FOSTER (1808 – After 1860 Census) was Alex’s 4th Grandfather; one of 32 in this generation of the Shaw line. Josiah Harvey Foster was born in 18 Sep 1808 in Northumberland, Saratoga, New York. His parents were Eliphalet FOSTER and Prudence PERKINS. He married Mary Ann TURK 28 Apr 1831. Alternatively Mary’s maiden name could have been Merritt or LaTouche. Josiah died in Wisconsin. Farmington Presbyterian Church – Josiah H. Foster and his wife took letters of dismissal 4 Feb 1854, from this church in Tioga County PA to a Presbyterian Church in Wisconsin. One source said that Madame De Long was born in France. A family legend says that Ruth was also a descendent of the Marquis De Longe who was guillotined in the French Revolution and his wife and daughter escaped the country and his daughter married an American. Other sources say Mary Ann’s maiden name was LaTouche or that her brother was Hiram Merritt. She has also been called Margaret. So far, I have not found any details behind these alternatives or the guillotined Marquis legend. Family legend also says Mary Ann’s mother may have beeen related toGen Nathanial GREENE of the Revolution. My grandmother’s second cousin Lydia Townsend remembered seeing a family silver tray that had belonged to him. She didn’t know what had become of it. I have worked Nathanial Greene’s family tree up to grandparents and down to grandchildren without any connection so far. 9. William Thomas Foster 28 Nov 1846 New York? In 1828 there were but four log cabins in Farmington township, Tioga, PA and that in 1830, when the first election was held, there were but eleven voters. If this be true, the township must have grown rapidly during the next year, inasmuch as the assessment list of 1831 shows sixty-five persons, who were assessed as owners of seated lands and personal property within its boundaries. Among the more prominent of these, in addition to those already named, were Ives Chamberlain, Zebediah Clark, James Works, John and Daniel Crippen, Jacob Lichenthaler, David Cummings, Job Herrick, Lockwood G. Hoyt, Freeman Place, Alva Cummings, John C. Robb, Samuel P. Babcock, Jonathan Sobres, Nathan Bottom, Charles Carr, Randall Drake, George Stanley, William Perrigo, Johnson Butts, Henry B. Turk, Harvey Foster, Hiram Merritt, Samuel and Daniel Buckbee, and Abner Webster. It appears that Harvey’s father had died by 1840 as his mother was already living with them. A Harvey Foster was named an elder when the Farmington church was formed in 1844. Josiah’s middle name was Harvey so they must have been related. 10 Feb 1844 – Mrs. Prudence Foster, Josiah Harvey Foster and his wife, Mary Ann Foster were charter members of the Presbyterian Church of Farmington. They had previously been members of the Presbyterian Church in Ekland, PA. 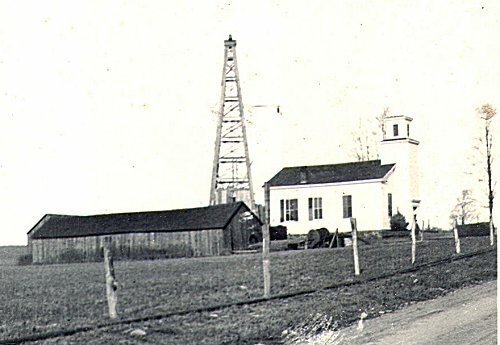 They lived at the head of a stream in the hollow to the east of the hill where the Grange Hall is located, the stream being known as Foster Brook, near the present natural gas pumps, and near the home of Mr. And Mrs. Lucien Palmer, who celebrated their 65th wedding anniversary July 4, 1944. The Fosters went west, selling their farm to James Beebe, who sold to Shipman, who sold to W. E. Close, and it is now  owned by Rhodes Butler. Mrs. Prudence Foster, (“Granny Foster”) died March 24, 1856. Mary Ann, wife of Josiah Harvey Foster, was a sister of Hiram Merritt, grandfather of Myra Merritt, first wife of William E. Close of Tioga. Josiah H. Foster and his wife took letters of dismissal February 4, 1854, to a Presbyterian Church in Wisconsin. They had a son baptized, William Thomas, in January, 1847, and three daughters October 31, 1852; Mary Catherine, Adelah, and Lydia. In the 1850 census, Josiah Foster and his family were living in Farmington Township, Tioga County, Pennsylvania. The township population was 636 at the 2000 census. Josiah was a farmer and his farm was recorded at $1000. J H’s wife was recorded as Margaret born about 1811 in New York. Prudence Foster, age 75 was recorded as living with the family. Josiah H. Foster and his wife took letters of dismissal 4 Feb 1854, from the Farmington Presbyterian Church in Tioga County PA to a Presbyterian Church in Wisconsin. In the 1860 census, Josiah H Foster and his family were living in Arlington, Columbia County. Wisconsin. Josiah’s farm was recorded at $4,150 and his personal estate at $600. Josiah’s wife was recorded as Mary born about 1812 in New York. All the children older than 18 had left home. Columbia County is now part of the Madison metro area. 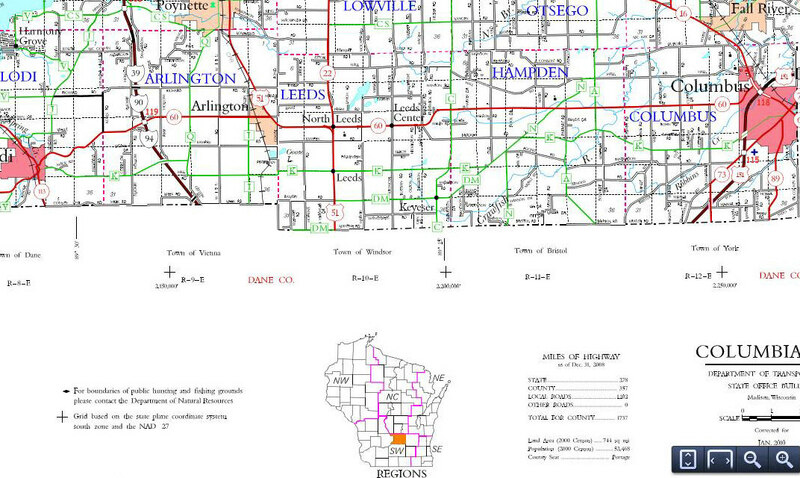 Vienna Township, Dane County where William Shaw had his Cherry Orchard is one township to the south. Arlingtonis a Townshp in on the southern border of Columbia County, The population was 484 at the 2000 census. Josiah’s or Mary Ann’s mother may have been related to Gen Nathanial Greene of the Revolution. Ruth’s cousin Lydia Townsend remembered seeing a family silver tray that had belonged to him. The Presbyterian Congregation of Farmington was organized February 10, 1844, at the house of Johnson Butts near Farmington Hill. The constituent members were Johnson and Lucy Butts, John C. Robb, Miss Prudence Crippen, Mrs. Prudence Foster, and Josiah H. and Mary Ann Foster. The elders have been Johnson Butts, Peter M. Close, John C. Robb, Harvey Foster, P. L. Butts, O. H. Blanchard and D. P. Close. Rev. S. J. McCullough, who organized the church, was its pastor till 1848. His successors have been Revs. Thomas E. Woodcock, J. Gordon Carnahan, F. Rand, 1859; Fred Graves, 1866; S. A. Rawson, 1873; Benjamin Russell, 1880; C. B. Gillette, 1881; R. G. Williams, 1885; S. P. Gates, 1889; J. L. Campbell, 1890; John H. Elliott, 1892, and W. C. McCormack, who took charge in January, 1896. He is also the pastor of the church at Tioga. A church edifice was erected in 1851 at a cost of $1,200, and has been repaired as needed. The congregation is a strong one. Services have been held with but occasional interruption since the society was organized and a good Sunday-school maintained. The society was incorporated February 14, 1853, upon the petition of John Harrower, Peter M. Close, Isaiah H. Foster, Johnson Butts, John C. Robb and Leverett L. Wilson. Letters of dismission and recommendation were presented as follows, viz., Johnson Butts and Lucy, his wife, from the Presbyterian Church of Lawrenceville, Pa.; John C. Robb, from the same; Miss Prudence Crippen from the Presbyterian Church of Painted Post; Mrs. Prudence Foster, Josiah H. Foster and Mary Ann his wife from the Presbyterian Church of Elkland. The letters being found in order, the persons presenting them were asked if it was their wish now to be organized into a church on the principles of the Presbyterian Church in the United States. The question having been answered in the affirmative they were declared to be a Church of Christ, and directed to proceed to the election of a Ruling Elder or Elders. They resolved to elect but one Elder at the present time, and Mr. Johnson Butts who had held the office of ruling Elder in the Church of Lawrenceville was elected to the same office in this Church. It was also resolved that this Church be called the Presbyterian Church of Farmington. Mr. McCullough then preached a sermon from John 5:1, preparatory to the Lord’s Supper. Mrs. Prudence Foster, Josiah Harvey Foster and his wife, Mary Ann Foster were charter members who lived at the head of a stream in the hollow to the east of the hill where the Grange Hall is located, the stream being known as Foster Brook, near the present natural gas pumps, and near the home of Mr. And Mrs. Lucien Palmer, who celebrated their 65th wedding anniversary July 4, 1944. The Fosters went west, selling their farm to James Beebe, who sold to Shipman, who sold to W. E. Close, and it is now owned by Rhodes Butler. A child of Josiah H. and Mary Ann Foster is buried in the old and abandoned cemetery located in a pasture about 100 yards north of the Farmington Methodist Church. The marble stone, found lying flat, has this inscription – “Jane Maria, daughter of Josiah and Mary Ann Foster, died Sept. 15, 1852, aged 4 years, and 17 days.” This land, now owned by Fred Ackert, was once possessed by Hiram Merritt, four of whose children’s names are on stones found there. Hiram Merritt married Mary Ann Foster, according to their niece, Mrs. Mary Merritt Hall of Osceola, Pa.
Jeanette’s husband Charles Bradley was born about 1822 in Vermont. He married Jeanette 15 Oct 1856. In the 1860 census, Jeanette and Charles were farming in Arlington, Columbia, Wisconsin. In the 1880 census, Jeanette was widowed and keeping a hotel in Red Bluff, Madison, Montana. (About 30 miles north of Virginia City and 30 miles south of Bozeman on Montana State Route 84. 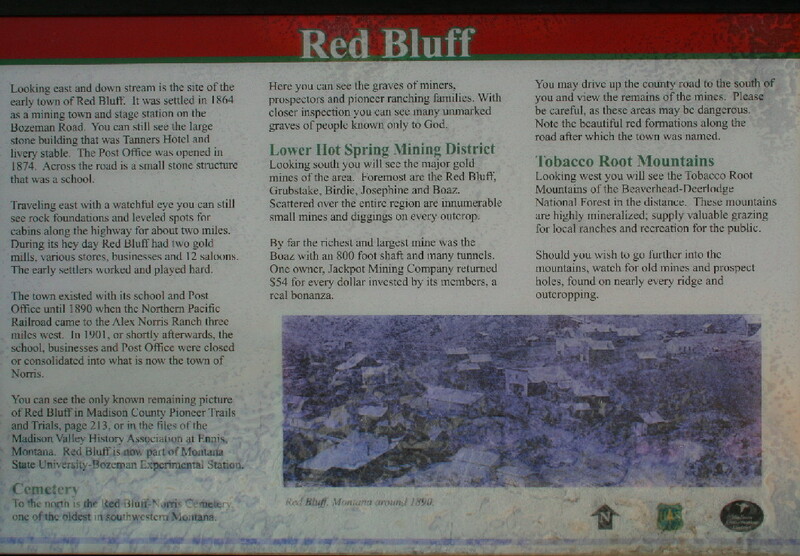 Today Red Bluff is a Montana State University Research Ranch located near Norris in Madison County, Montana, along the west side of the Madison River. The operation comprises 13,750 acres of land, 10,000 deeded and 3,750 leased. Most of this land is rangeland, with limited hay meadows along the valley bottoms. Elevations range from 4,600 feet to 6,200 feet above the Madison River canyon. 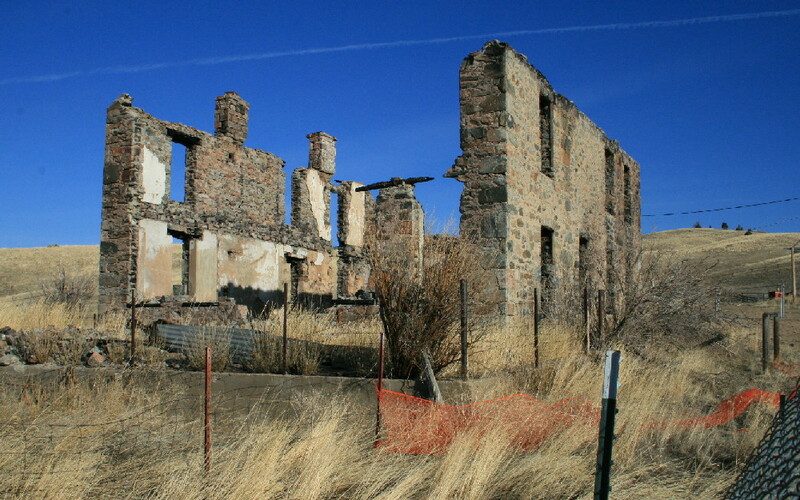 The ranch occupies most of the once thriving late 19th-early 20th century gold mining community in the Hot Springs Mining District which was second only in gold production to Alder Gulch. At its peak of activity, there may have been a population of approximately 3,000. The ranch nearly surrounds the town of Norris. The founder of Norris, Alexander Norris may have owned much or all of the Red Bluff Ranch at one time. The Red Bluff Research Ranch (previously known as the Rowe Brothers Ranch) was purchased for $164,000 ($16.83 per acre). The total acreage was 9,746. Two U. S. Forest Service Grazing Permits (Muddy Greek, Cache Creek) in the Gallatin National Forest came with the Rowe property. Some small additional land exchanges and purchases have taken place over the last 45 years. The grazing permits were returned to the Forest Service in 1976. A new lambing facility and mixing barn at the ranch was constructed in about 1990. This made lambing much easier. There are currently about 170 head of cattle and 900 head of sheep maintained on a year round basis at the research ranch. These livestock along with the range areas are used for both teaching and research. i. Darwin J. Bradley (1859 Wisconsin – Before 1920 census Oregon); m. Kate B. [__?__] (b. 1879 Kansas) Kate first married 1898 in Oregon to Frank Linn (b. May 1873 Oregon) and had two children including Forrest Linn b Jul 1899. In the 1910 census, Darwin and his family were living with his sister Mary’s family in Abernathy, Clackamas, Oregon and Darwin was working as a photographer. By the 1920 census, Kate Bradley was widowed and still living with Mary and Bion Commons in Portland, Oregon. 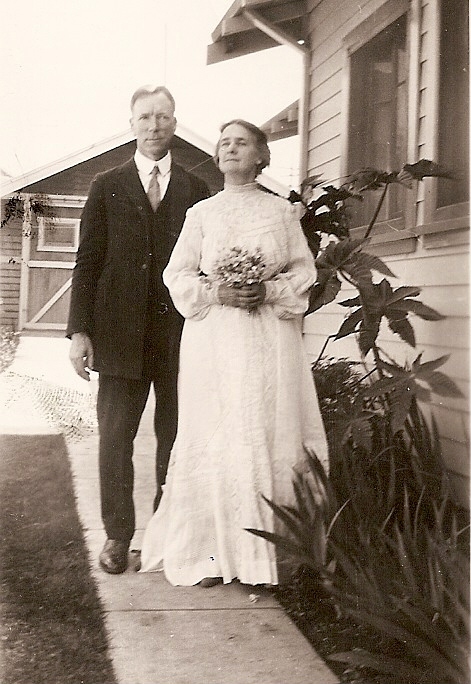 In 1930, Kate was gone, but Forest was still living with Mary and Bion in Portland, now with his bride Edna. In the 1910 census, Bion was a farm laborer in Lents, Multnomah, Oregon. In 1914, Bion was a carpenter living at 7915 SE Foster Road, Portland, Oregon. Robert’s wife Thrize Eggleston was born in 1834 New York. Her parents were Richmond Eggleston (2 Feb 1811 Mass – 6 Jun 1889) and Sarah [__?__]. She married Robert on 20 May 1857. Thrize died after 1910 census in Wisconsin. In the 1860 census, Robert’s father-in-law, Richmond Eggleston , mother-in-law, Sarah Eggleston (1812 Connectictut – ) and younger sister Catherine lived with the young couple in Vienna, Dane, Wisconsin. In the 1880 census, Thirza was a widow and living with her father Richmond Eggleston in Vienna, Dane, Wisconsin. i. Annie Foster (abt 1872 Wisconsin – Aft. 1930 census ) Annie was adopted. Her parents were born in Norway. m. Hans Igard (b. 1867 Norway – d. Bef. 1930 census). In 1900 Hans was married to his first wife, Carrie Igard, who he divorced prior to 1910, leaving Carrie with 5 young children to raise on her own. In the 1910 census, Thirza was living with Annie and Hans in Vienna, Dane, Wisconsin. In the 1930 census, Anne was a widowed servant living with the William Higgins family in Westport, Dane, Wisconsin. Caroline’s husband Augustus Phineas Smith was born 30 Mar 1805 in Connecticut. His parents were Peter W. Smith (? – 1850) and Sally [__?__] (1777 – 1870). He first married Eliza Ann Hanchett in 1833. Eliza was born in 1809 in New York and died Mar 1854 in Arlington, Columbia Wisconsin. Augustus died 7 Jan 1870 in Dekorra, Columbia, Wisconsin. 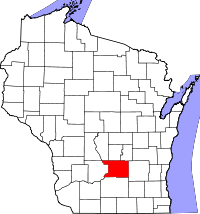 In the 1850 census, Augustus and Eliza were living in Kossuth, Columbia, Wisconsin. i. Lewis Henry Smith b. 7 Jun 1834 in Burnt Hills, NY, d. 21 Jan 1901 m. Adella P. Foster Caroline’s younger sister See Adella’s section for their children and other details. ii. James Edward Smith b. 27 Feb 1836 in New York d. 14 May 1919 m. Phebe Look (1841 Massachusetts – 21 Dec 1926 Marion, Oregon) children Arthur, Edgar (1860), Jane “Jennie” (1865), Lewis E (1862) and Arthur (1878). In the 1870 census, James and Phebe were farming in Arlington, Columbia, Wisconsin. In the 1900 census, James was a furniture dealer in Wheatland, Vernon, Wisconsin. In the 1910 census, James and Phebe were living in Santa Cruz, California. Three children Lovina, Edward and Sadie; In the 1870 census, Sarah was living with her brother James and teaching in Arlington, Columbia, Wisconsin. In the 1910 census, Jane S was living with her widowed daughter Vina Seymour in Sterling, Vernon, Wisconsin. In the 1920 census, Vina and Sarah were living in North Ellensburg, Kittitas, Washington. These marriages between relations are confusing, here’s a chart to help explain. Lewis Henry Smith married his step aunt (unrelated by blood and still 16 years younger than himself. .
Sarah Ann’s husband Jeremiah K Rossman was born about 1832 New York. He married Sarah Ann 1 Jan 1856 in Fayette County, Iowa. In the 1860 census, Jermiah, Sarah and Charles were living in Vienna Dane Wisconsin. Jermiah’s farm was immediately following Sarah’s brother Robert Harvey Foster’s in this census. In the 1870 census, a single Sarah Rossman born about 1840 in Pennsylvania was keeping house in Vienna, Dane Wisconsin. In the 1880 census, Charles was married to Sina [__?__] (b. 1862 Iowa) and had a three month old daughter Viola in Turkey Creek, Mitchell, Kansas In the 1900 census, Charles was farming in McKenzie, Lane, Oregon. They had a large family. Christina married first John G. Dunning 3 Jul 1856 when she was just 17. Christina married second 1 Jan 1860 to William Perry Morton. He was born 8 May 1833 in Leverett, Franklin, Mass. His parents were Chauncey Morton ( 1799 – 1879) and Betsy Pike (1800 – 1864) After Christina died he married 1 Nov 1871 to Christina’s niece Sarah Jane Smith (See above) and had three more children. William died 27 Sep 1902 in Retreat, Vernon, Wisconsin. It’s curious he didn’t want to adopt his step-daughter, but felt fine marrying his dead wife’s niece. A Union Army Private John C. Foster was interred Sep. 16, 1864, Little Rock National Cemetery, Little Rock, Pulaski County Arkansas, Plot: 7, 4639 just one day after the death date we have. Mary Catherine’s husband Nathan Cook Peirson was born 27 June 1835 in Indiana. His parents were Solomon Peirson (1810 – 1879) and Martha Cook (1813 – 1838) He was a private in 8th Regiment, Ohio Cavalry. After Mary died of childbirth 2 Aug 1869, he married 25 Sep 1869 in Jefferson County, Nebraska to Priscilla Puckett (b. 1852 in Indiana – ) and had at least two more children Mary E. Pearson (1877 – ) and Charley Pearson (1879 – ). Nathan died 24 Dec 1903 in Fairbury, Nebraska. In 1870, “Perriscilla” was “keeping house” for Nathan, but by 1880 they were married. In the 1910 census, William was the president of a college in York Ward 1, York, Nebraska. In the 1920 census, William was general secretary of [illegible] in Dayton, Ohio. In the 1930 census, William was a United Brethren Minister in Kansas City, Kansas. Three children: Lena Schell Caldwell (1882 – 1973), Louis Irving Schell (1886 – 1951), Ruth Alice Schell b. 1893 . William’s first wife Ann (Amelia) Hageman was born in 1853 in Wright, Luzerne, Pennsylvania. Ann died 18 Jan 1888 in Sheds Bridge, Gallatin, Montana. In the 1880 census, William and Amelia were farming in West Gallatin Valley, Gallatin,Montana. In the 1910 census, William and Mattie were livng in Riverside Ward 5, Riverside, California and William was working as a carpenter. In the 1920 census, Mattie was keeping an apartment house in Long Beach, California, she is listed as married, but William was not in the household. William died in 1921 in Los Molinos California where his daughter Caroline Stryker lived. In the 1930 census, Mattie was managing an apartment house in Los Angeles.. In the 1910 census, John was a farmer in School District 38, Gallatin, Montana. By the 1920 census, Martha was out of the picture. In the 1930 census, John was a mail carrier in Bozeman, Montana. In the 1920 census, Oliver was a widowed farmer in Jacoby, Clark, Idaho living with his 11 year old daughter Mabel. Charles was 21 years older than Caroline, their youngest son David was born when he was 61 years old. In the 1880 census, he was a hired hand at his brother Daniel’s farm in Grants Pass, Jackson, Oregon. In the 1900 census, he was a widowed farmer in Belgrade, Gallatin, Montana and living with his mother-in-law. Emeline P Stiles (79.) In the 1910 census, Charles was a farmer in Mountain, Siskiyou, California. In the 1920 and 1930 census, Charles was a farmer in Los Molinos, Tehama, California. In the 1920 census, Cyrus was a widowed fireman at the St Vincent Academy in Walla Walla Ward 2, Walla Walla, Washington. His daughter Jessie May was a 14 year old student there. St. Vincent Academy was established by the Sisters of Providence of Vancouver in 1864. St. Patrick’s School for Boys was established in 1865 by the Christian Brothers. St. Patrick’s was renamed LaSalle Institute in 1899. The two schools merged in 1930. The school moved to its current campus in 1959 and was renamed DeSales Catholic school In the 1930 census, Cyrus was a lodger in Pasadena, California working as a forestry laborer. In the 1920 census Ruth and Elmer were living in Long Beach California with an infant daughter Mary and Elmer was working as a house carpenter. In the 1930 census, Ruth was living with her mother and sister Mary and working at a rental costume company. In the 1910 census, Mary was living at home in Riverside California and packing oranges. In the 1920 census, Mary was living with her mother in Long Beach and working as a clerk in a drug store. She was divorced from Lawrence Meyer and had a 4 year old son Lawrence Meyer Jr. In the 1930 census, Mary was living with her mother and sister Ruth. This time, her married name is shown as Moore instead of Meyer and her children are now Francis Moore 17, Imogene Moore 14, Eugenio Moore 13, and Mary Cena Moore 10.
ix. Grace Foster (8 Oct 1897 Bozeman, Montana- 19 Jan 1965 Camarillo, Ventura, California); m1. Anthony Gillespe (c. 1891 Merced, California – 14 Mar 1955 Los Angeles) His parents were Marcus Gillespie and Mary Moreno. m2. [__?__] Hawkins . In the 1920 census, Grace was married to Anthony Gillespie, had a young son Eldon and was living in Gardena, California, Anthony was working as an oil well driller. By the 1930 census, Anthony had remarried to Helen Philips and was living in Huntington Beach, California. Eldon Felix Gillespie (19 Aug 1916 in Kern, California – 6 Feb 1988 in Wesminster, Orange, California ); m. 26 Nov 1938 Long Beach, California to Irene Terry. In 1935, Grace was living in San Bernardino. In the 1940 census, Grace Hawkins was divorced living alone in Camarillo and working as a hospital attendant. Adella’s husband Lewis Henry Smith was born in 1834 in New York His parents were Augustus Phineas Smith and Eliza Ann Hanchett. Lewis died in 1901. Lewis was Adella’s step-nephew through her sister Caroline’s husband Augustus! You would think that only one couple would have robbed the cradle in a single family, but actually, both Lewis Henry and Augustus did. Here’s the math: Adela married Lewis Henry when she was 17 and he was 33. There was a 15 year difference between Caroline and Adela. Augustus married Caroline as his second wife when he was 49 and she was 18. In the 1880 census and 1900 census Lewis Henry was a farmer in Arlington, Columbia, Wisconsin. In the 1920 census, Ralph was a poultry farmer in El Cajon, California. In the 1930 census, Ralph was a real estate broker in Alhambra, California. Winifred and Ralph did not have any children. In the 1930 Lester was a salesman at an electric company in Oceanside, California. In his 1942 World War II registration, Albion was a rancher in Albion, Mendocino, California. This entry was posted in -6th Generation, Line - Shaw and tagged Arlington Columbia WI - Pioneer, Farmington Tioga PA - Pioneer, Gen Nathanial Greene's Family Silver Tray, Guillotined Marquis De Longe. Bookmark the permalink. Hi, I have op-dated Grace Harvey on my Johansen Family Tree born 1610-1680 married Edward Stanton born 1610-1677 son of Daniel Stanton born 1590,- married Alice RUSSEL born 1590,-. I have take a look at another Elizabeth Harvey nee Blyford of Norwich,Norfolk born 1718-1741 married Peter Harvey merriage 1739 at St. Helen,s Norwich. My question is : How are these people related or which is the right connexion between these Family Trees.??? It is very important for my Genealogy-Research in England concerning my Ancestors there. All the best wishes from Magnus T.J.Johansen, Ejde in Faroe Islands. His page has information about his siblings and his ancestors, but I don’t see any of the people you mention above. Hi, Mark , thank you very much for your information. I will give you my Links of my Family Tree for example so you can take a look at it self and maybe better understand me what I need in my British Research. http://www.myheritage.dk/site-126669071/johansen . Please set op com instead for dk for the Link .http://www.jewishgen.org with the ID#367887 . And here the Link for Elizabeth Harvey nee Blyford of Norwich, Norfolk. http://www.jjhc.info/harveyelizabethblyford1741port.htm and my own Homepage on Danish Language: http://www.123hjemmeside.dk/Eidijohansen I am also on Ancestry and GENI.com . Yours sincerely. Mr. Magnus from Ejde in Faroes. Thanks for your note. It’s interesting that your family stayed in Farmington Township while mine moved to Wisconsin (Josiah and Mary Ann were dismissed from the Farmington Presb. Church Feb 4, 1854) then to Montana (my grandmother was born in what’s now the ghost town of Giltedge) and finally San Diego where I was born. Inspired by your note, I updated Eliphalet Foster’s page https://minerdescent.com/2010/08/05/eliphalet-foster/ with info about his grandchildren. Do you know about Buckbee Burial Ground on Croft Hollow Road, Farmington Township? Hi! Mark, yes I know about the Buckbees and I live not far from their Burial Grounds.Yes,my Family is still here and I love being here. If there is anything I can look up for you ,let me know.